The home environment should be an extension of the school learning environment. It is here that learners should be doing their homework and reflecting on what has been taught at school. Andrea Juan and Mariette Visser looked at the resources learners obtain at home that could help them perform better. When considering the resources learners have access to within the home environment, three predominant factors were assessed: educational, general (socioeconomic status) and parents. Using data from the 2002 and 2011 Trends in International Mathematics and Science Study (TIMSS), several significant changes were observed. The presence of certain items in the home creates an atmosphere that promotes academic skills and motivation. Examples of educational resources at home are own books, a study desk, a computer, an internet connection and a separate, dedicated room. Only 9% of South African grade 9 learners – compared to 25% internationally – had more than 100 books at home. A quarter (25%) of grade 9 learners had their own room and internet connection at home, while the comparable figure internationally was 53%. What was also evident from the analysis was that performance decreased with a decrease in home resources. In addition, a comparison of 2002 with 2011 public school data on the number of books at home of South African grade 9 learners showed no significant improvement. To enable international comparison, an index called the Home Educational Resources Index was developed using the following components: the number of books at home, the availability of two specific home-study resources (own room and internet connection) and the highest level of education of either parent. Table 1 shows the percentage of leaners and their average mathematics achievement scores, according to the 2011 Home Educational Resources Index. The study suggested that there was a positive association between the number of resources at home and the achievement scores of learners – the more resources available, the higher the achievement scores (Table 1). It was further evident that almost half the grade 9 learners (42%) had very limited educational resources at home. The wide learner performance range (from 487 to 333 points) between learners who were not affected and learners who were affected a lot, pointed to inequity in the system. The socioeconomic status of a particular household is positively associated with educational performance. The presence of certain assets relates to the socioeconomic context in which the learner lives. These typically include items such as refrigerators, calculators, computers and internet access. From learners’ reports, the presence of electricity and water supply increased since 2002. The percentage of learners with electricity at home increased by 6%, while the percentage increase in the number of learners with running tap water at home grew by 7%. The presence of electronic devices such as televisions, video players, computers and CD players in learners’ homes also increased during this time. In 2002, almost all public school grade 9 learners had a radio at home. In 2011, television took the place of the radio, with 88% of public school grade 9 learners having a television at home. In addition, the percentage of learnerswith their own room, access to a motor car in the household and a fridge at home also increased since 2002. Conversely, the data showed that the percentage of learners with resources such as a study desk, dictionary and their own bicycle decreased since 2002. It was encouraging that a third of students (31%) indicated they had ready access to the internet. The study suggested that there was a positive association between the number of resources at home and the achievement scores of learners – the more resources available, the higher the achievement scores. There is a strong relationship between learner achievement and parental education, especially that of female guardians. In 2011, 19% of parents had completed a university degree. This was a substantial increase from 2002, where 11% of parents had completed a university degree. 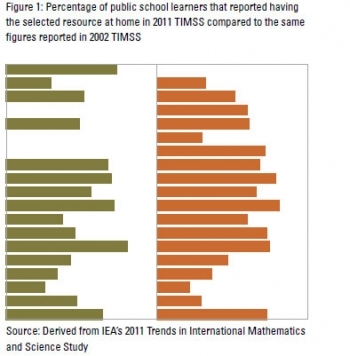 The qualification levels of parents positively affected learner performance in mathematics. The corresponding figure for international learners was almost twice the South African figure of 32%. Parents themselves are resources that learners can use to supplement what is taught at school. Learners were asked various questions related to parental involvement and interest in learners’ schoolwork at home. The study suggested that parental involvement in learners’ schoolwork was relatively high; more than 80% of learners’ parents spoke to them about their schoolwork or checked if they had enough time to do their homework once or more times per week. Furthermore, 66% of learners’ parents made sure that their children set time aside for their homework on a daily basis; 61% of learners’ parents asked them every day what they were learning in school; and 54% of learners’ parents checked daily if their homework had been done. Although South Africa’s average household income increased nominally by 113% in 2011 compared to the last census in 2001, a comparison of available selected educational resources in 2002 and 2011 in learners’ homes did not show remarkable changes. The evidence showed considerable resource limitations and shortages at most of learners’ homes and their school environments compared to international standards. However, there have been improvements in terms of parental education levels and home conditions since 2002. A continuation of this trend may eventually lead to improved educational outcomes. Authors: Andrea Juan, Researcher, and Mariette Visser, Research Manager, Education and Skills Development research programme, HSRC.